Statistical analysis of the text of the MS (further subdivided into five areas). Almost the entire Voynich MS is written in a script that is not found in any other surviving (old) document. The text of the MS has been written mostly in a line-by-line manner, obviously from top to bottom and from left to right. The majority of this text is written in short paragraphs, which are often separated from each other by a larger line spacing. Herbal pages typically have two or three such paragraphs, which tend to occupy mostly the upper half of the page, clearly avoiding the herb drawing. Pages in the so-called biological section tend to have much more text, filling the entire page, sometimes with just three paragraphs, but occasionally also more. The text tends to have a straight left margin, and is only roughly right-justified, except for the last line of each paragraph which tends to be shorter. The text consists of groups of characters separated by spaces, and these groups seem to form words. The same words tend to appear throughout the MS, with a frequency distribution that is quite normal for a meaningful text (1). In some places, single 'words' are written near elements of drawings. These have come to be called 'labels'. There is a clear suggestion that these words provide the name of the object in question. Many of the label words also occur in the running text, though only rarely do they also occur in the immediate vicinity of the label. Labels near plant parts in the illustrations of the so-called pharmaceutical section. They are also written inside, or near the containers that have been drawn in these pages. There are also places in the MS, for example in the cosmological section, where single words appear as elements in the overall design, but not necessarily near an identifiable object. The last example is strictly speaking what John Grove called titles, but all three cases are of interest. I have counted 17 pages that include centred end lines, 11 pages with right-justified end lines and 5 pages that use 'titles'. Almost all astronomical, astrological and cosmological pages have circular drawings, some with text written in normal paragraphs, but all with text that has been integrated in the drawings. Frequently, text is written along the circumference of these circles, and occasionally also along radial lies. The following figure shows an example of text along the circumferences and along radii of such a circular drawing. In some circular designs and occasionally also in in the margins of some pages, sequences of single characters or short words may be found. These are usually referred to as key-like sequences. They have been included in the table at the bottom of this page, with the keyword 'SEQ'. The circular diagram on f57v deserves special mention here, as there appear to be several sequences of words and characters integrated in this figure. Since there is no reason to call these 'additional' or 'extraneous', these alone are not included in the table . In a few places it appears as if the first characters of lines were written in a vertical column first, possibly in order to create a straight left margin. The remainder of the text was then added later. The following example is one paragraph on f88v. In addition, there are several places in the MS where writing seems to have been added 'afterwards' or where the text was perhaps not written in a strictly top-down line-by-line manner. One clear example is f105r, where one may observe a text break and a use of different inks before and after it, and also a partial line added above the last paragraph in the darker ink. There are more examples of this type of change in the MS. 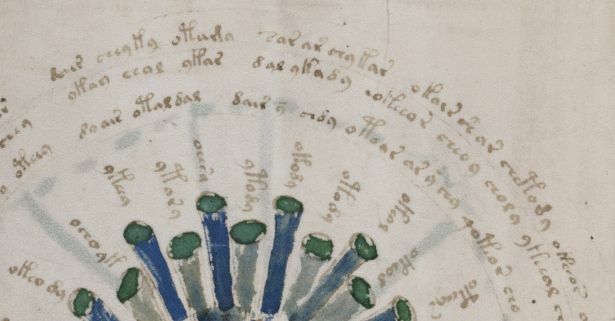 While the earlier owners of the Voynich MS (Barschius, Kircher) may possibly have believed that the writing represented a languague unknown to them, nowadays we know that there is no other old MS that uses the same writing. Ever since it was brought to light by Voynich, people have compared the script with examples of writing. A summary of this is provided in section 4 of D'Imperio (1978) (2), and this may serve as the basis for the following. The remaining set has been compared with alchemical symbols or early renaissance ciphers. These are also briefly addressed below. In medieval manuscripts numerous more or less standard abbreviations and ligatures were in use. A collection of such abbreviations may be found in the dictionary of Cappelli (1912) (3), which lists, in alphabetical order, a large number of abbreviations found in Latin and Italian manuscripts. While browsing through this dictionary, one will immediately recognise the similarity between some of its enties and the writing in the Voynich MS. D'Imperio (see note 2) shows a few cases in Fig.17. Figure 42 in D'Imperio, taken from Gessmann (1922) (5) shows some similarities between Voynich MS characters and a few alchemical symbols. There are only a few examples, and it is not certain whether this is coincidental or not, since these alchemical symbols were not known to me to have been in use in the early 15th century. Potentially of great interest is the comparison between the characters in the Voynich MS and the symbols found in early renaissance cipher systems. D'Imperio (Fig.39) shows examples from a cipher of Parma (1379), A Venetian cipher (1411) and the Code of Urbino (1440). While these do not show exactly the same characters as the Voynich MS, there are some striking similarities, and the author of the MS may well have been inspired by these, or similar, examples. Of particular interest is the codex of Tranchedino (MS Vindobonensis 2398 in Vienna), which has been issued in a facsimile edition (6). This MS lists numerous, rather similar sets of ciphers to be used with different correspondents, and they are dated from 1450 to 1496. 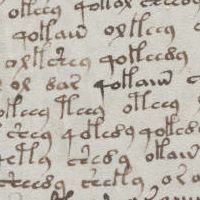 None of these ciphers uses the gallows characters mentioned above, but the common sequence 4o (see also the various illustrations of Voynich MS text above) appears several times, typically representing a single character. Other typical features of the ciphers in Tranchedino are that they include nulls (characters that are introduced but have no meaning), and that double characters are usually represented by a single code character. Among the few known examples of manuscripts from the 15th century that have been written in code are two manuscripts by the humanist Giovanni Fontana (ca. 1395 - ca. 1455). Also these are available in facsimile edition. More information about Fontana and his cipher may be found on a web page by Philip Neal (7). The initial characters of many paragraphs are larger than usual, and are sometimes embellished with additional curls or dots. Not all characters in the MS can appear in a paragraph-initial position, and indeed these characters form only a very small subset. 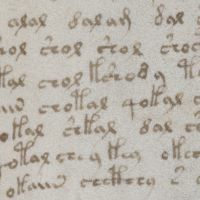 In addition to this, there are two initials highighted in red on the first page of the MS (f1r), which are not standard characters in the Voynich MS alphabet. These have been the subject of some speculation, and many years ago I was struck how one of them appears almost identical to the old Aries symbol in Greek astronomical manuscripts (see in particular here. More recently, a convincing argument has been presented on >>this blog page by J.K.Petersen. The conclusion is that these symbols have been used for centuries as emphasis or paragraph markers, and it is apparent that the Voynich MS scibe was familiar with these. The text of the MS includes numerous rare characters. Many of these appear only once in the MS, and could be considered aberrant forms of standard characters. Others appear several times, and are concentrated in some pages of the MS. One of these has been called the 'picnic table' (x). Other examples may be found in the next page about transcription of the text. A still largely unexplored area of the Voynich MS is a palaeographic analysis of the writing. Since the script is unique, it does not lend itself very easily to such analysis, but a few comments have been recorded. They fall into two categories. The first is whether the type of script can be placed in a geographical or temporal context. In this respect, the herbalist Sergio Toresella stated in 1995 (8) that the handwriting of the MS was a humanist hand, which belongs to 15th century Italy. While some doubts have been expressed over the years by non-experts, it was recently confirmed by another handwriting expert (9). An interesting point with respect to the humanist hand is, that this was not at all popular in the time before printing, and it was an elitist hand primarily used for classical texts, but not for medical texts or by scribes (see note 9). Because the same ink and the same kind of penstrokes appear in the illustrations and because the text forms an integral and unified part of many of the illustrations, it appears probable that the same person wrote the text and drew the illustrations. Toresella also stated (see note 8) that the entire MS appears to be in the same hand. A contrary opinion was stated by Prescott Currier, who was the first to point out (11) a variation in handwriting style. He also correlated these with textual statistics, which are described on another page (12). He called the main hands '1' and '2', and the textual variations languages 'A' and 'B', and proposed that the 'A' text was written mostly in hand '1' and the 'B' text mostly in hand '2'. Currier even tentatively identified several more hands, which he called 3, 4, 5, X and Y. The following 'cuts' from various pages of the Voynich MS show the different handwriting styles usd in the different sections of the Manuscript. Currier's classification of languages into A or B has been reflected in the font used in the captions. Red and bold for A-language, blue and italic for B-language and neutral when no identification was given. Each image represents a similar-sized section of a page. At first sight, only the Herbal-B page seems different, but more samples should be compared before any conclusions can be drawn. In addition, this sort of analysis should be done by an expert paleographer. Pending that, it would appear as if Currier's correlation between hands and languages, which he based mostly on the herbal section, may not be valid for the other sections. It is worth noting here, that the features of the last lines of paragraphs described under the term 'titles' above, mostly appear in both 'styles'. Centred and right-justified lines appear in pages of all hands, while titles in the strict meaning of the word are only found on pages in language A and hand 1 (13). I remember I talked too much, but did I really say "the ms. does not include a single erasure or correction"; whatever I said, this is my present opinion: in all my experience of manuscripts I have never come across one in which corrections and erasures are so unobtrusive as they are in this ms. if it contains any. I have looked through it again - of course not every word, and have nothing to add to the one or two probable corrections I recorded c. 1936 when I worked with photostats. 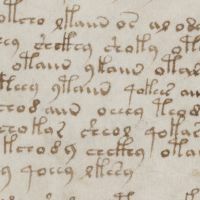 In this connection I must add that we still have a few Voynich estate mss. (requiring additional research which I never found time for, before I attempt to sell them) which include one beautifully written text on fine vellum and some well and some poorly written manuscripts; and in none of them is there any difficulty in detecting corrections, erasures, deletions or transpositions. This apparent lack of corrections has occasionally been taken as evidence that the scribe could not understand what he wrote, or even that the text is meaningless. Ever since high-resolution images of the MS have been publicly available, closer scrutiny by many people has revealed a few cases where it appears that the text has been emended. Following are those cases I am aware of, which shows that such corrections are few and minor. This general term is used to indicate several different types of additional writing that may be found in the MS. Only very few barely legible phrases in the normal (non-Voynich) alphabet may be observed in the Voynich MS. These are listed below, including the numbering of folios and quires. Quire marks are found most commonly (but not always) on the verso of the last folio in each quire, in the lower right corner, while folio numbers have been added in the upper right corner of the folios, when the pages were folded in. Both appear to have been added after completion of the MS. They are discussed in some more detail on a previous page (see also here). On several of the cosmological pages the characters 'a', 'b' and 'c' have been written in the top corners: fol. 67r1, 2, fol. 68r1, 2, 3, fol. 70r1, 2. These are written in pencil and were obviously added by a later owner of the MS. This may date from as late as the Jesuits of the Collegium Romanum, or even Wilfrid Voynich. Month names have been written in a later hand in the central drawings of each of the zodiac pages: fol. 70v2,1, fol. 71, fol. 72 and fol. 73. On some of the earlier herbal pages in the beginning of the MS we find individual letters, and in one case the word 'rot', in or near leaves, flowers and stem of plants. 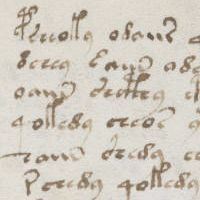 These appear like colour annotations, and were already discussed here, in the frame of the origin of the MS. A detailed list of these annotations has been added to the table at the bottom of this page with the key word 'COL'. On f1r we find the faded or erased ex libris of Jacobus de Tepenec. This is discussed in more detail on a dedicated page. The ex libris of Jacobus de Tepenec. In addition, in the right margin we find faded or erased character tables, which are presumably a decryption attempt by a later owner. On f17r we find a largely unreadable comment near the top margin. 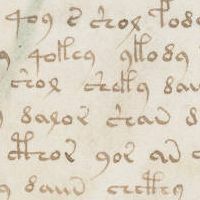 Nick Pelling was the first to observe that this also includes one or two words in the Voynich script, barely visible in normal light, but clear under UV illumination. They seem to read: oteeeon oiil but in particular the second word is not clear. See also Pelling (2006) p. 164, where he reads oteeeol aim (15). In the left margins of f49v and f76r we find detached sequences of characters, in the former case accompanied by the arabic numerals 1-5. On f66r we find both characters and short words in the left margin. Near the bottom of the same page we find some apparently German words, which have been partially amended, near the dead body of a man or woman, and some other objects. This was first interpreted by R. Salomon as 'der Mussdel'. I would propose the reading 'Musmel'. Neither are generally accepted. There is also some writing in the Voynich script, this time clearly visible. 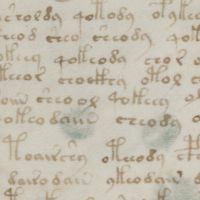 The text on f116v is a short paragraph of text including what appears to be German, Latin and two words in the Voynich script. An additional line is slighty offset above this, in the top margin. It is perhaps the most debated text in the entire MS.
On f66v and f86v3 we find strange, unreadable yet similar scribbles of which it is hard to say whether they represent readable text or not. They are usually referred to as chicken scratches. These two have been added to the below table with the key word 'SCR'. More chicken scratches may be observed above the roots of fol. 43r, but these really look like scratches, so are not counted. The following table combines all types of additional or extraneous writing into a single overview. This includes observations brought together by many different observers. As already indicated above, the sequence(s) of characters integrated in the circular design of f57v is not included here. 1v COL L A single 'g' under the paint of the second leftmost green leaf The suggestion is that this indicates that it should be painted green. 1v COL L A less clear single letter, possibly a 'J', inside the lowest yellow leaf right of the stem It is not clear that this is ink under the paint. It is hard to identify this as a colour indication. 2v COL L Cursive 'fo' or 'fa' in dark ink just above the first word of the second paragraph. Similar to 'fo' (meaning folio) annotations on all pages of the alchemical herbal Firenze MS 106. 9v COL L Several characters in the top left flower under the blue paint: 'por' in the top petal, 'p' in the lower left petal and 'r' in the lower right petal Readings are tentative. These may also be colour annotations. 9v COL L An unclear letter of scribble between the top two petals of the top left flower Meaning not clear. 9v COL L A single 'g' to the right of the top right flower Seems to be another colour annotation. 11v MAR Nr The nr. 88 (or Voynichese dd ?) close to the edge of the page, at the height of the second last line. Seems to refer to the Voynich character sequence dd found on that line. 17r MAR L+V Small writing in the top margin of the page. Under UV illumination, one or two words in Voynich writing, largely faded, can be seen at the end of this fragment. 20r COL L A 'p' (or possibly an 'r') at the top of the root system Could be another colour annotation. 28v SCR ? Some apparent symbols in the middle of the flower If this is writing, the script has not yet been identfied. 29r COL L An 'r' in the higher part of the root system Could be another colour annotation. 32r COL L A 'p' and what looks like a 'v' or an 'r' in the bottom right flower. There could be another character after the 'p'. These could be more colour annotations. 39v LET L A capital B in the white space between the two green part of the bottom right leaf. 49v SEQ V+L A vertical sequence of single characters in Voynich script in the left margin, aligned with and just before each line of writing. In addition, the numbers 1 to 5 to the left of the top five characters. Both may have been added after the main text was added. 76r SEQ V+L A vertical sequence of single characters in Voynich script in the left margin, aligned with some of the lines of writing. 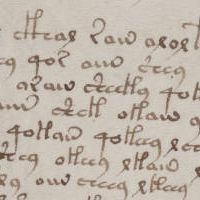 116v MAR L+V Recipe or spell, in a mixture of pseudo-Latin and German, with two words in Voynich script. Additional marginal drawings. The frequency distributions of words and characters are analysed in more detail in the analysis section of this web site. For the words in particular, see this page. The frequency distribution that is hinted at is called Zipf's law, which is also explained here. Tavola (table) iv (see note 3 above). In priv.comm. to Jim and Karen Reeds. I hope to be able to quote the source of this statement soon. His uncertain statement made in 1954 may be found here (question 9). See in his online paper. 'Titles' are found on f1r, f8r, f25r, f42r and f68r2. Only for the last case, Currier did not identify the 'hand'. In this case, it is also possible that a 'split' was simply needed because of the drawing. As described in King (2001), pp.138-139 and p.398. I am grateful to Don Hoffmann for this reference.